On July 4th, 1928, nearly three years after the opening of the Erie Canal, Charles Carroll, 91 years old and the last surviving signer of the Declaration of Independence, turned over the first shovel of dirt, marking the beginning of construction of the Baltimore and Ohio Railroad, America’s first railroad.1 With this single action, the Erie Canal’s death notice had been signed. Even before the B&O was created, the Mohawk and Hudson Railroad was incorporated in New York on April 17th, 1826, less than six months after Governor Dewitt Clinton dedicated the grand opening of his “ditch.”2 Ironically, the purpose of the Mohawk and Hudson was to compete with the Erie Canal. When New York’s railroad finally managed to finance itself, (delayed financing allowed the B&O to be constructed first), it could be built. Completed a year later in August, 1831,3 it took less than an hour to travel the 17-mile rail line compared to the all-day meandering 40-mile segment of the Erie Canal it replaced.4 The name of the steam locomotive to make this first run: none other than The Dewitt Clinton. By the time Birdsill Holly made his Hydraulic Tunnel in Lockport, President Millard Fillmore and four of his cabinet members had already sat aboard the first two trains to travel across the 459 mile mainline of the New York & Erie Railroad between Dunkirk and Port Jervis, New Jersey.5 The Erie, in catering to New York’s southern tier, bypassed Lockport and the Canal altogether. On the other hand, in 1853 eight separately operating railroads, all running from Albany to Buffalo and including two through Lockport, would consolidate to become the New York Central.6 The future in transportation had arrived, and Greater Western New York would soon find itself right in the thick of it. I’ll save that for the next chapter. Here, we pay homage to the little engine that could – all those short line railroads that once traversed Greater Western New York only to disappear into the afterthought of history. Things seemed to go a bit smoother from then on. The Arcade and Attica Railroad was so successful during the Great Depression, it didn’t need to lay off a single employee.8 On the other hand, heavy rains in January 1957 caused the Tonawanda Creek to overflow its banks, washing out hundreds of feet of track.9 With little business between North Java and Attica, the Board of Directors decided to abandon the line rather than rebuild it.10 To this day, the Arcade and Attica Railroad operates only between Arcade and North Java. In 1962, faced with declining freight revenues, the railroad decided to go into the steam engine passenger excursion business. This is where I enter the picture. 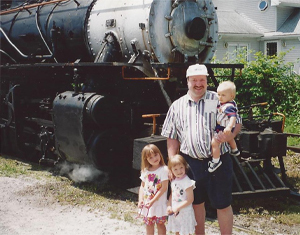 So it was no surprise that my parents took my brother Kenny and I to ride the Arcade and Attica Railroad soon after it opened its steam excursion. What was a surprise was that my mother convinced my father to allow my uncle to tag along. He’s only three years older than me, meaning back then he was just as much a kid as I was, if not more so. I don’t remember how old I was, but I was old enough to remember the raw joy of riding on a real train for the very first time. And that it was a steam locomotive with bright orange cars made it all the better. We (well at least my brother and I) behaved well enough in the coaches for my father to agree to take us out on the open air gondola. My uncle got to go, too, but, apparently, he didn’t have to behave. When we went out to the low-sided railroad car, we had to be careful. It wasn’t as if we had to be careful walking between the open platform cars. That was easy. We had to be careful of the soot and ashes coming from the engine’s smokestack. Depending on the direction of the train and the direction of the wind, sometimes we’d get sprayed with very tiny, but still hot, cinders. I don’t remember ever get hit by any. What did strike me back then, as it does today, was the placid vista along the route of the leisurely paced train. 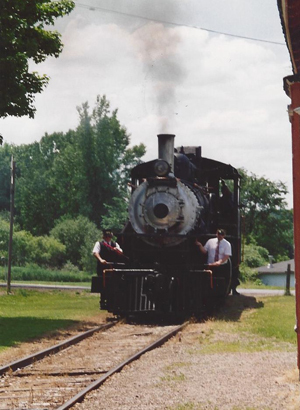 With the exception of a few obviously modern structures, very little has changed since the Tonawanda Valley Railroad first ran in the latter half of the nineteenth century. Slowly snaking through the gentle rolling farmland of Wyoming County, it was as if we were riding through a Currier and Ives setting. Coincidentally, the excursion stopped at what I thought was an open field but now know to be the quaint hamlet of Curriers. We detrained and the engineer permitted us to inspect the locomotive and its cabin “as long as we didn’t touch anything.” My uncle touched something. Luckily, he didn’t burn himself, but he did get good and greasy dirty. Boy was my father mad. He held it in. Several decades later and with much greater knowledge, I took my own young family on that same trip. This time I knew more of the history of the Arcade and Attica, as well as the history of northeast railroads in general. For example, I now recognized the passenger cars we sat in were original Delaware, Lackawanna & Western “Boonton” coaches. These classic cars, which ran on the DL&W from the 1920’s until the dreaded merger with the Erie in 1960, are much beloved by railfans. The Arcade and Attica also has several matching DL&W combines, an even rarer piece of rolling stock. I could see the genuine excitement in my kids’ eyes as we rode the train and toured the steam locomotive. It reminded me of a certain little boy’s eyes some thirty or forty years earlier. I sigh now, just thinking about it. Anyone with the least bit of yearning for the nostalgia of yesteryear’s yesteryear – the real hidden gem of the Arcade and Attica Railroad – must make it a habit to visit this jewel on a regular basis. It’ll recharge your batteries. The unfortunate truth about all things railroad is, eventually, they’re gone. So it’s important to experience them before a new future removes them from the physical world and consigns them to world of memories, just like it has done to our next hidden gem.